We take great pride in being part of an elite group of Class 4 departments in North Carolina. We provide the Riceville Community with fire and emergency medical services, 24 hours a day, seven days a week. Please feel free to browse around for useful safety tips and information about our department. 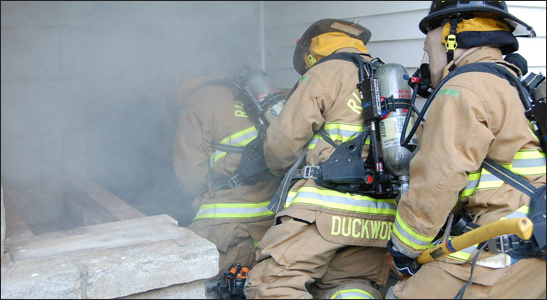 Volunteer firefighters devote their time to protect you and your community. Duracell's Power Those Who Protect Us donation program lets you give back to these selfless heroes. When you purchase specially marked CopperTop packs, they will make a battery donation to volunteer fire departments to power communication devices and life-saving equipment. Each pack contains a unique code, which you can enter to direct your battery donation to a volunteer fire department of your choice. Special Called - Board of Directors Meeting will be Wednesday, April 24, 2019 at 6:30 pm. Reminder to change your batteries in your smoke alarms when change your clock this weekend. Smoke detectors saves lives. Riceville Vol. Fire Department will be working in conjunction with The Blood Connection to host a blood drive on June 7, 2018 from 3:30 - 8:30 pm. Please see flyer for more information. Visit us at 2251 Riceville Rd, Asheville NC 28805 to receive a burn permit and useful information on burning. "To provide professional fire and emergency medical services to the Riceville Community and safeguard the quality of life through training and education." This site has been viewed 136,140 times.